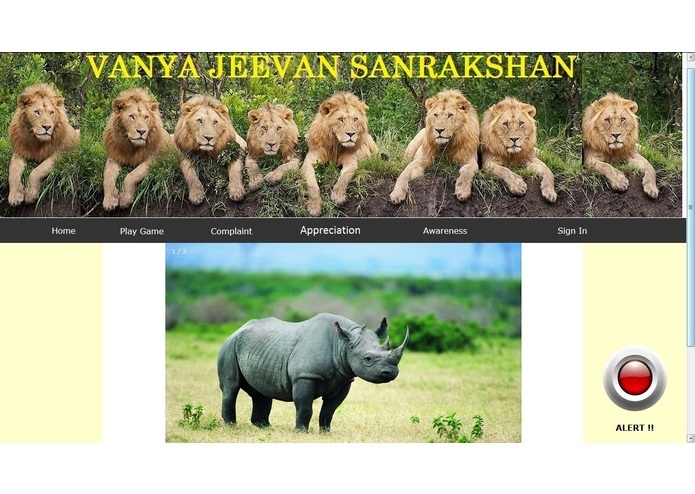 Inspired By The Technical Solution To End Wildlife Trafficking Problem Statement, Our Solution Is Vanya Jeevan Sanrakshan Website. It’s A Website To Educate And Aware Citizens To Stop Trafficking By Means Of A Quiz And Imparting Knowledge Of Wildlife Acts And Laws, Wildlife Facts And Wildlife Myths. It Would Also Send An Alert To The Regional Authority Informing About The Location So That Proper Action Should Be Taken Accordingly. 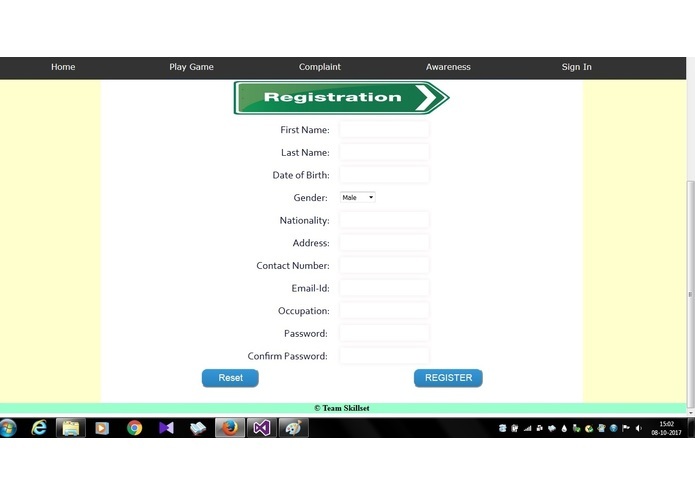 We Focus In Particular On Educating, Creating Awareness And Sending Alert To The Authority By Registering And Logging In The Website. 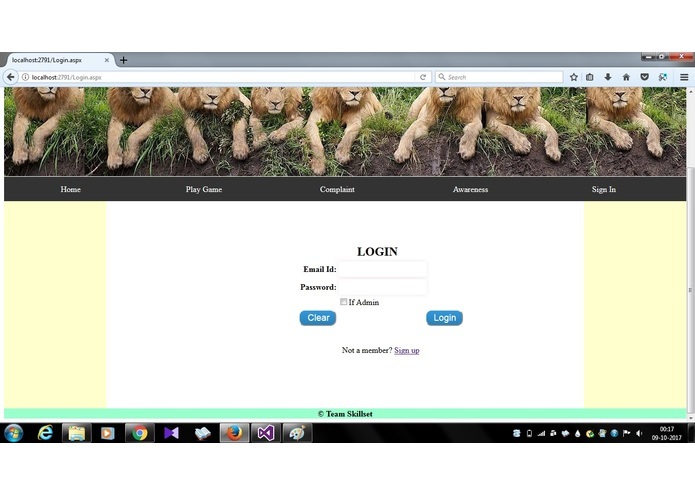 We Used Microsoft Visual Studio 2013 (Asp .Net With C#), Html5,Css3 And Sql 2012. Might Be Time Consuming To Register And Login For User. Network Issues In Remote Area. Alert System To Directly Transfer Location Of Suspicious Activity To The Authority Without Revealing Informer Identity. Online Quiz With Prizes. Wildlife Is Very Important For Humans Survival. 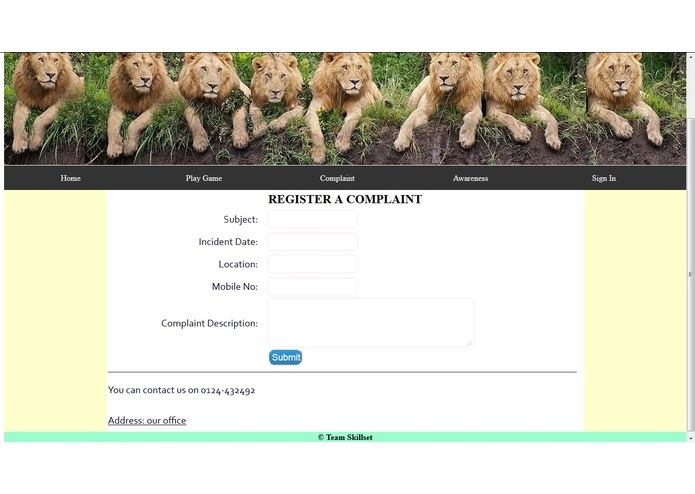 Various Platforms Are Available To File A Complain About Animal Trafficking. -Can Be Multilingual To Connect To Local Masses. -It Could Be Embedded In Existing Government Websites To Tackle Wildlife Trafficking. -Can Be Converted As Multilingual App Too Which Make It Easily Accessible All Over The Region. 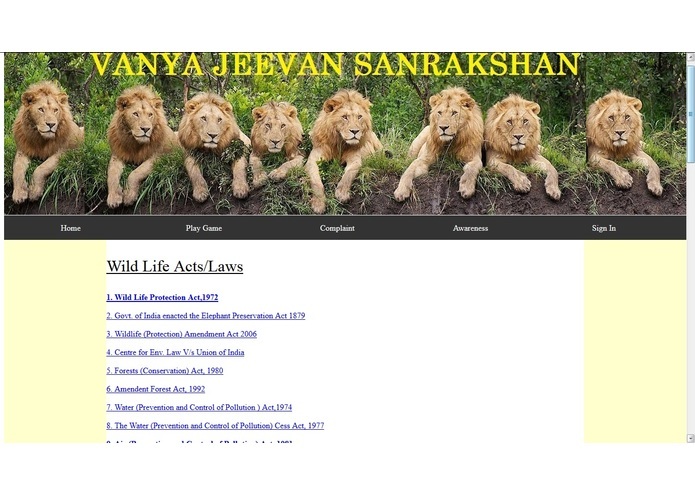 -Wildlife Laws And Acts Can Be Enforced To Provide Better Scope To Wildlife. -Authorizes To Introduce A Joint Venture With Government To Give Penalties For Defaulters Or Guilty Person. I worked on main idea and presentation . I worked on the front end and the back end of the website. I worked on front end. Applied CSS on Website's pages. I mainly focused on the ideas and ways which can be implemented to deliver an effective result to end wildlife trafficking. Prepared effective presentation to convey our idea efficiently. I assisted Archana in making sql tables for quiz questions. I proposed different ideas on how we can aware people about wildlife. I worked on database, I created database for quiz as our website propose the idea of spreading​ awareness among local people about wildlife facts and importance.